OBO Goal keeper ogo cloud leg guards blue medium hockey goalkeeper pads kit. Condition is Used. Damage to right pad pictured doesn't affect usage. Dispatched with Royal Mail 2nd Class. Here I'm selling my old goalkeeping equipment Obo robo large hi control kickers - repaired as seen. Works fine. Obo cloud large leg guards Obo cloud left & right hands All in working order. OBO Legguards - Used. Slightly worn on the bottom of the pad as shown in photo. OBO INDOOR GK Legguards - Used. Black floor markings are on right leg due to smothering but could be washed out if needed. 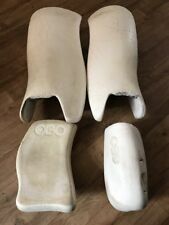 OBO Ogo Legguards Size Large. Used but very good condition.Dispatched with Royal Mail 2nd Class.